What do the dolphins look like in the footage? Occasionally we're lucky and the dolphins jump out of the water but mostly we just see a fin as the dolphin quickly pops up to breathe. If we spot dolphins what should we do? Please send us the date and time (or a screenshot showing the date&time) so that we can easily find the place on the recorded footage to collect the data. It helps a lot, thanks! You can use our contact form (click here) or email it to iknowthatdolphin@gmail.com. PS Don't worry if the dolphins aren't in the picture. The date&time are what's important. Sharks swimming at the surface are extremely rare in Richards Bay - if you see a fin it is most likely a dolphin. ​Is there any point in searching when it's windy? ​No, not really. All the waves and white "horses" (splashes) make it very difficult to spot dolphins. Can we see them at night? Unfortunately not, even with the infra-red function, so the camera just keeps an eye on its immediate surroundings. What are the red and yellow buoys for? These buoys mark the position of the shark nets and baited hooks. Sometimes the top of the shark net with many small yellow floats can be seen. What else might we notice? 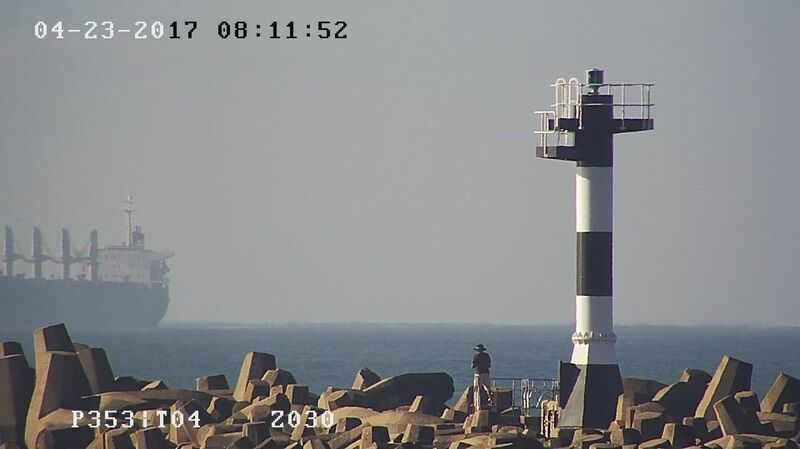 At the end of the North Breakwater there is a Dolphin Viewing Platform. It is probably the best place in South Africa to see this endangered mammal. It was built by the Richards Bay Surf Lifesaving Club, Portnet and the Endangered Wildlife Trust.